“ We wanted open minds not poisoned by Detroit ”. And engraved in wood instantaneously in 1875-77 by several engravers of the Xylographic Institute of Adolf Closs (“at his time one of the best of his profession in Germany”, Thieme-Becker), but also by the latter himself. See Osteneck, Zur xylograph. Darstellung im 19. Jhdt., in Lüneburger Beiträge zur Vedutenforschung, 1983, pp. 120 ff., too; Hanebutt-Benz, Studien zum dt. Holzstich im 19. Jhdt., Frankfort 1984.
wood engravings printed without tone plate of quoted size with continuous local, also directly picture-related text below and on the back. Occasionally with further wood engraving on the back in which case frame-ready double-sided passepartout is supplied. Lake Constance, At / B . In front angler + charging of boat, on the water sailboats. 6⅜ × 7¼ in (16.3 × 18.3 cm). – BACK: Disturbed Rest. Bull chasing lazing tourists over the fence. 5½ × 7¼ in (13.9 × 18.5 cm). Friedrichshafen, Departure in / B . Luggage-rich activity at the landing place together with view of the quarter. 4¾ × 7⅜ in (12.2 × 18.7 cm). Rorschach / B . General view with lakeside. 6¼ × 7⅜ in (16 × 18.7 cm). – BACK: Rheineck. General view over the lake. 4¾-5¾ × 7⅜ in (12.1-14.5 × 18.7 cm). Bregenz, Old / B . Partial view. 5¼ × 7⅜ in (13.5 × 18.7 cm). – BACK: Ferry over the Rhine at Rüthi + Rheineck. 2½ × 7¼ (6.3 × 18.5) and 2 × 6⅞ in (5.2 × 17.5 cm) resp. Romanshorn / B . Shoreside. On the lake i. a. big passenger steamer. 4¾ × 7⅜ in (12.2 × 18.8 cm). Rorschach, St. Anna Castle near / A . With lakeview. Untersee seen from Arenenberg, The / B . 6½ × 7⅜ in (16.5 × 18.7 cm). Constance – Central view with barges at the quay / B (varyingly with Dutch text). 4⅞ × 7⅜ in (12.4 × 18.7 cm). Constance – Harbour Part / B (varyingly with Dutch text). At the quay an especially interesting large tugboat. 3¾ × 7¼ in (9.6 × 18.3 cm). Minimal fox-spots in the picture. – BACK: Same place. Department Store (Concilshaus). 3½ × 4⅜ in (8.9 × 11.1 cm). – After the Fight on the Rhine Bridge / B . 5¾ × 7¼ in (14.6 × 18.5 cm). – BACK: Franz Baron of Wessenberg. Head portrait. 4¼ × 3⅜ in (10.7 × 8.5 cm). – See the complete description. Steckborn, Department Store in / B . On the lake boats. 4⅞ × 5⅞ in (12.5 × 14.8 cm). – See the complete description. Stein on the Rhine / B . Central view below the citadel from the opposite bank. Steamship scenery. 6⅝ × 7⅜ in (16.9 × 18.8 cm). – BACK: Tower in Schaffhouse. 7⅞ × 4 in (20 × 10.2 cm). – See the complete description. – Detail View / B . In front well, view through archway. Rich accessories, i. a. covered wagon. 8 × 6⅜ in (20.2 × 16.3 cm). Schaffhouse – Street in Sch. / A . Richly frequented with well front right and the tower at the end. – See the complete description. – Central view / B (varyingly with Dutch text). On the water in front fishing boat + raft dominating. Behind Laufen Castle on the right the rising moon. 5⅛ × 7⅜ in (12.9 × 18.8 cm). – BACK: Hohentwiel. 3 × 6¾ in (7.6 × 17 cm). – Street Scene from Sch. / B . Gable-bay-house. At the well in front huntsman, laundry women, water carrier, goats. 8¼ × 6¼ in (20.9 × 15.8 cm). – BACK: Traditional Costume in the Canton Schaffhouse. Young woman with basket. 5⅜ × 3⅝ in (13.7 × 9.2 cm). – See the complete description. – Rhine Falls / A – See the complete description. Jungfrau Seen from small Mountains, View on the / B . 8⅜ × 5¼ in (21.2 × 13.3 cm). – BACK: Arven Group. 8⅞ × 5½ in (22.4 × 14.1 cm). Lake Geneva – Part between Meillerie and St. Gingolph / B . 3⅜ × 7⅜ in (8.7 × 18.6 cm). 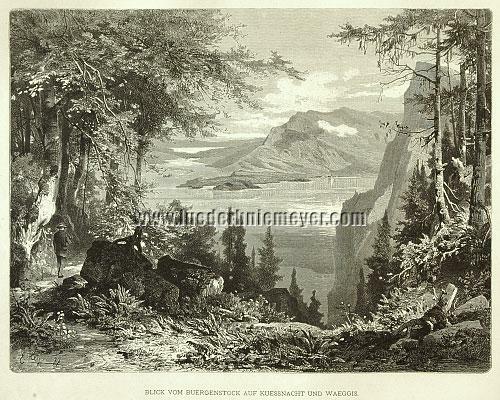 – BACK: Shepherd from the Meglis Alp in Appenzell. 6¼ × 4⅝ in (16 × 11.7 cm). – Vufflens Castle near Morges / B . 5⅜ × 7⅜ in (13.6 × 18.6 cm). – BACK: In the Bernese Oberland. The family at home. 7⅞ × 6¼ in (19.9 × 15.8 cm). – Beach at Evian / B . 3¾ × 7½ in (9.4 × 18.9 cm). Diodati. The picturesquely situated Villa Diodati at Cologny with Lake Geneva in the background. In front beside orange trees and pumpkins lute with open music book. Steel engraving. C. 1855. 5 × 7⅜ in (12.6 × 18.8 cm). – The wide white margin slightly dusty upper right. – See the complete description. Bernese Houses / B . 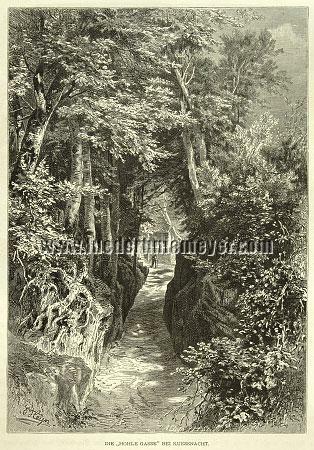 Narrow alley before mountain scenery. 5½ × 7½ in (14 × 18.9 cm). Andermatt, Before the Post Office in / B . Richest crowding between post wagons and horses for individual travelers à la mountain-headed in the background with cargo carrier walking alongside. 5⅝-6⅞ × 7 in (14.2-17.4 × 17.8 cm). – Very instructive . Mountain Tour in the Rain / B . Mounted traveler and cargo carriers, partially with umbrella, on the pass road. 8⅞ × 3⅛ in (22.4 × 7.9 cm). Stop at an Alpine Diary / B . Tourists riding up with umbrellas. Beside these i. a. a mountain guide with rope. 4¾ × 7⅜ in (12.2 × 18.7 cm). – BACK: Bergamask Shepherd at the Morteratsch Glacier. 5⅛ × 7⅜ in (12.9 × 18.7 cm). Alp, On the / A . Shepherd with cattle. Furka / B . 5¾ × 7⅜ in (14.7 × 18.7 cm). « This is not time to settle what they are . Great projects are at work , and hatching now . Simplon, Mountain and Village / B . 4⅝ × 4⅜ in (11.7 × 11.2 cm). – BACK: Guide from the Engadine. With pole, rope and ice-axe. 6¼ × 4½ in (16 × 11.5 cm). Gotthard Road, The Devils Bridge on the / B . On this i. a. coach with six horses. 8 × 5¾ in (20.2 × 14.7 cm). Fluela Pass / B . 5⅞ × 7⅜ in (14.9 × 18.8 cm). – BACK: Sumpter-horses. Heavily loaded trail in the snowy high mountain region with blockhouse in the background. 4¾ × 7⅜ in (12.2 × 18.7 cm). Appenzeller, Female / A . Two young women in dignified ambience. On the right the tambour. Saentis, The / B . 7⅝ × 5⅝ in (19.5 × 14.4 cm). Appenzell / B . General view before mountain scenery. 5 × 7⅜ in (12.8 × 18.7 cm). St. Peterszell, The old Vicarage in / B . Together with surrounding houses. 5¼ × 7¼ in (13.3 × 18.5 cm). St. Gallen, Market Street in / B . Crowded, at the end the cathedral. 8¼ × 4¾ in (20.9 × 11.9 cm). – Lace-maker from the Canton St. G. / B . 6 × 4 in (15.2 × 10.3 cm). – BACK: Traditional Costume in the Canton Thurgau. Woman at the well. 6¼ × 3¾ in (15.8 × 9.6 cm). Appenzeller in lined Shirt / B . With pipe + umbrella. 6⅜ × 4½ in (16.2 × 11.5 cm). Appenzell, Part from / B . With church. 4⅜ × 7⅜ in (11.2 × 18.7 cm). Appenzeller House, In a / A . The young woman knitting stockings, a second one at the spinning-wheel. Hosenlupf / B . Wrestling youth at a traditional enjoyment. 3¾ × 7¼ in (9.5 × 18.4 cm). Appenzell, Old Woman from / B . 6¼ × 4⅜ in (16 × 11 cm). Heiden, Wooden Houses in / B . 5⅞ × 7⅜ in (14.8 × 18.7 cm). 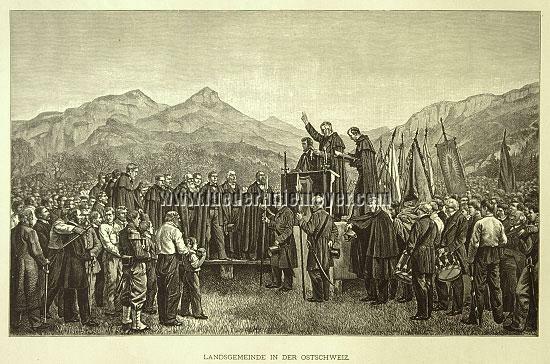 Landsgemeinde (Cantonal Assembly) in East Switzerland / A . Inauguration and swearing-in of the Landsgemeinde on open field by the Landammann (chief magistrate) standing behind the elevated desk. – See the complete description. floats as tiny island in the immense sea of Euroland . Appenzeller House / B . Before woman with umbrella. 6¾ × 3⅝ in (17 × 9.1 cm). – BACK: Female Appenzeller in festive dress. 6⅜ × 4½ in (16.1 × 11.5 cm). Wildkirchli, Inn To the Aescher at the, with view at Hoher Kasten and Kamor / B . 8¾ × 6⅛ in (22.2 × 15.5 cm). Ebenalp, Evening on the / B . Occupational scenery. 5 × 7⅜ in (12.8 × 18.2 cm). Murg at the Walensee, In / B . Farm with women at the well. 5½ × 7¼ in (14.1 × 18.4 cm). 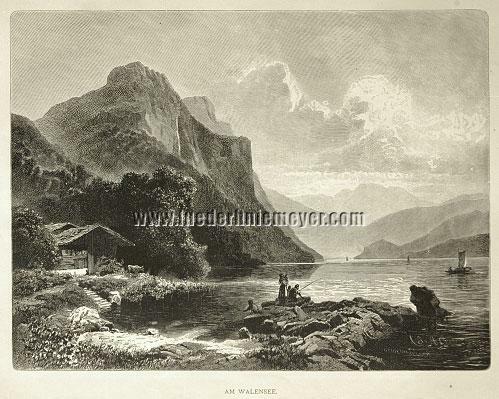 Walensee, At the / A . In front blockhouse + angler. Boats on the lake. – See the complete description. Glarus, Church on the Mountain near / B . 5¼ × 7¼ in (13.5 × 18.5 cm). Klönthalsee, At the / B . 6⅜ × 7¼ in (16.3 × 18.4 cm). (Zurich, At the Lake of) / B . With fishing boats + sailboats and large steamship. 3⅜-7¼ × 1⅛-7⅛ in (8.5-18.4 × 3-18 cm). – See the complete description. Lake Dwellings / B . In front prehistoric hunters with bows and cleavers recovering a shot fallow-deer from the water. Behind the lake dwellings before moonlit mountain scenery. 8¾ × 6½ in (22.2 × 16.5 cm). – See the complete description. Zurich, Part from / B . In front market scenery before well; vista of Great Minster. 7⅞ × 5⅝ in (20.1 × 14.3 cm). Zurich, Bauschänzli in / B . Boat + steamship scenery. 4½ × 7⅜ in (11.3 × 18.8 cm). – BACK: Zurcher Fruit Seller. Offering especially apples, but also pears and grapes. 6 × 4⅝ in (15.2 × 11.6 cm). Rapperschwyl / B . View of the quarter below the palace down to the lake. Among the Hotel Steinbock. Boats and two steamships. 5⅜ × 7⅜ in (13.6 × 18.8 cm). Zurich, Rathhausquai in / A . Market on the bridge and further rich scenery. – See the complete description. Habsburg Castle / B . 3⅜ × 7⅜ in (8.5 × l8.6 cm). – BACK: Traditional costume in the canton Aargau. Young girl at the distaff. 5½ × 3⅞ in (13.9 × 9.9 cm). Winterthur, Room in Wülflingen Castle near / A . With party with wine and female servant dishing up. Kyburg Castle / B . 6⅝ × 5⅞ in (16.8 × 15 cm). – BACK: Peasant cottages in the canton Aargau. 5⅝ × 7⅜ in (14.3 × 18.7 cm). Wildenstein Castle / B . 6⅜-8¼ × 5-7⅜ in (16.2-21 × 12.8-18.8 cm). Lauffenburg / A . View of the quarter below the citadel. In front left the bridge with angler at this bank. – See the complete description. Aarau, Small Lane in / B . Merchant scenery. With fine vista of the steeple. 9 × 5⅛ in (22.9 × 13 cm). Zug, St. Martin’s Chapel in / B . 5¼ × 7⅜ in (13.4 × 18.6 cm). 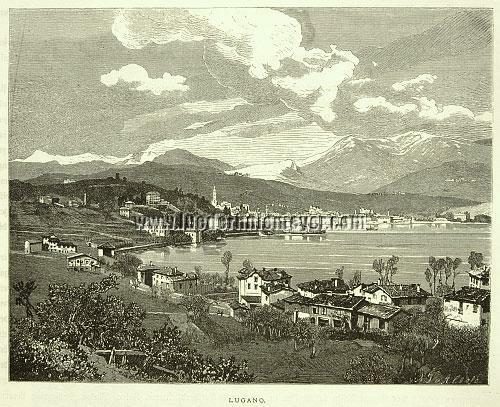 – BACK: Lake Aegeri. 4¾ × 7½ in (12.1 × 18.9 cm). Goldauer Landslide / B . 6⅞ × 7⅜ in (17.5 × 18.7 cm). Gersau, Group of sweet Chestnuts near / B . In front harvesters, laterally left steep steeple. 6¾ × 7⅜ in (17 × 18.6 cm). – BACK: Fishing Girl from Zug. Sitting in the boat. 6 × 4 in (15.1 × 10.3 cm). Lake Zug / A . View from the heights with the place itself in the foreground. Axen with Axen Road, The / A – See the complete description. Treib, Inn To the / B . At the moorings guests leaving for a boat trip while others are waiting for the approaching steamer. 6¼ × 7⅜ in (15.9 × 18.7 cm). – BACK: Church in Morschach. 5¼ × 7½ in (13.5 × 18.9 cm). Lake of Lucerne, View from the Axenstein across the / A – See the complete description. Tell’s Chapel / B . Boat scenery. 6¼ × 7⅜ in (15.9 × 18.7 cm). – BACK: Gallery on the Axen road. 7⅜ × 4¾ in (18.7 × 11.9 cm). – See the complete description. Uri-Rothstock, View from the Axenstein at the / A . Predatory bird over and steamer on the lake. – See the complete description. « Swear we the oath of our confederacy ! Never to part in danger or in death ! And sooner die than live in slavery ! Rütli, The / B . 7⅜ × 5¾ in (18.7 × 14.7 cm). – See the complete description. Fluelen, Part at the Lake of Lucerne at / A – See the complete description. Fluelen, Arrival in / B . General view from the lake. On this passenger steamship + boats. 5¼ × 7⅜ in (13.4 × 18.7 cm). – BACK: The Mythenstein. 4⅞ × 3⅞ in (12.5 × 9.8 cm). Gotthard Road at Wasen / B . 4¾ × 7½ in (12.1 × 18.9 cm). – BACK: Ascent to the Church in Altdorf. 8 × 5 in (20.2 × 12.7 cm). Bürglen, Church in / B . Scenery of church-goers, in front right corner view of the inn with its fine arms. 7 × 7⅛ in (17.7 × 18.2 cm). – BACK: Attinghausen Castle. 6¼ × 5⅞ in (15.8 × 15 cm). Bürglen / B . Central view. 6⅛ × 7⅜ in (15.7 × 18.7 cm). – BACK: Glen of the Schächen. 7⅝ × 3⅞ in (19.5 × 9.9 cm). Inschi, Sawmill in / B . Ox-wagon. 4⅛ × 7⅜ in (10.5 × 18.8 cm). – BACK: Departure of the in Fluelen. 4⅝ × 4⅛ in (11.7 × 10.5 cm). Faulenbach Fall in the Ernstfeld Valley / A . Shepherd scenery. – See the complete description. Ernstfeld Valley, Scene from the / B . 7 × 4¾ in (17.7 × 11.9 cm). – BACK: Girl from the Schächen valley. 5⅜ × 3⅞ in (13.8 × 9.7 cm). Silenen, Street in / B . Carriage scenery. 5⅛ × 7¼ in (13.2 × 18.5 cm). 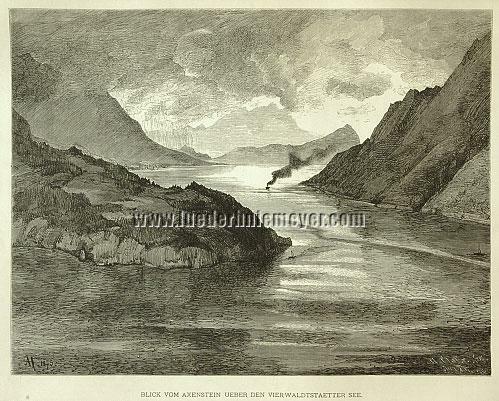 – BACK: Lake Faulensee. 3¾ × 5 in (9.6 × 12.6 cm). Silenen, Churchyard of / B . 5¼ × 7¼ in (13.3 × 18.5 cm). – BACK: Zwing-Uri. 5⅛ × 7¼ in (12.9 × 18.4 cm). Amsted / B . General view with approaching (tourist) coaches. 3⅝ × 5⅞ in (9.3 × 14.9 cm). – BACK: St. Anton’s Chapel at the entrance into the Maderan Valley. 6⅛ × 4 in (15.6 × 10 cm). – The latter view somewhat foxing. 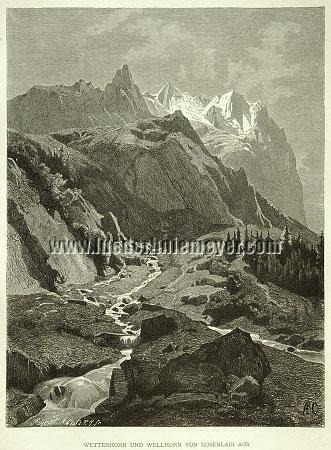 Maderan Valley, Hüfi Glacier in the / B . With predatory bird. 6⅞ × 7⅜ in (17.6 × 18.7 cm). Unterwaldner in festive Dress, Female / B . 6⅛ × 4¾ in (15.7 × 12 cm). Längalp in the Melch Valley / B . 8⅛ × 7 in (20.7 × 17.8 cm). « To mild a ruler am I to this people . Been tamed to due submission , as they shall be . Sarnen / B . Central view with the arched bridge in the center. 5 × 7⅛ in (12.7 × 18.2 cm). – BACK: Part from Sächseln. Scenery at the well. 4½ × 5⅜ in (11.3 × 13.7 cm). – See the complete description. Buochs, Charnel-House in / B . Visitor scenery before the skull shelf. 6¼ × 5⅜ in (16 × 13.8 cm). – BACK: Milker of Buochs. Smoking his pipe at the open window. 6⅛ × 4¼ in (15.5 × 10.8 cm). Stanz, Room in the Winkelriedshaus at / B . 5⅞ × 7⅜ in (14.9 × 18.8 cm). – BACK: Storm in the Mountains. 7¾ × 5⅝ in (19.7 × 14.4 cm). Rozloch Glen / B . 8⅜ × 6¼ in (21.4 × 15.8 cm). Thunderstorm in the Mountains / A . Cattle, goats + donkeys. – See the complete description. Bürgenstock from Hergiswil, View at the / B . 5⅜ × 7⅜ in (13.6 × 18.7 cm). – BACK: View at the Titlis from the Way onto the Pilatus. 4⅝ × 3 in (11.7 × 7.7 cm). Küssnacht and Wäggis, View from the Bürgenstock at / A – See the complete description. Engelberg, Cottage in / B . Alpine dairy scenery. 5⅛ × 7½ in (13.1 × 19 cm). Lucerne, Chapel Bridge and Water Tower in / B . Boat and people scenery. 5⅛ × 7⅜ in (13 × 18.8 cm). – BACK: The Spannoerter seen from the Engelberg Valley. 5 × 7⅜ in (12.7 × 18.8 cm). – See the complete description. Wäggis, The Lake of Lucerne at / A – See the complete description. Pilatus Peak the “Donkey”, The / B . 5½ × 7⅜ in (13.9 × 18.8 cm). 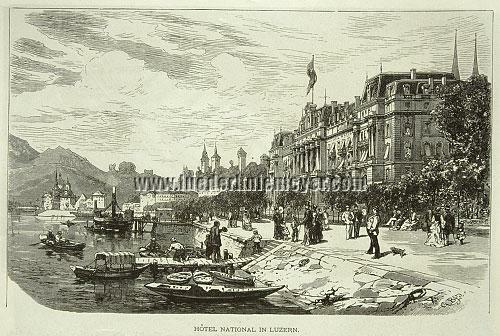 Lucerne, Hotel National in / B . Rich boat and passers-by. 5 × 7½ in (12.6 × 18.9 cm). – BACK: (Boat) Still Life by the Lakeshore. 4⅜ × 7½ in (11.2 × 19 cm). – See the complete description. Lucerne / B . View of the quarter at the landing stage of a large passenger steamship. Appropriate scenery. 5⅜ × 7⅜ in (13.6 × 18.7 cm). – BACK: Pilgrims on the Vierwaldstätter See in view of another steamer. 5⅝ × 7⅜ in (14.3 × 18.7 cm). Lucerne, Market in / B . Under mighty colonnade with appropriate scenery. 5⅝ × 7⅛ in (14.2 × 18 cm). – BACK: Sempach and Lake Sempach. Central view with lake view. 5⅝ × 7¼ in (14.2 × 18.5 cm). Lucerne, View from the Hotel Schweizerhof in / A . Steamer and rich boat scenery. Now , Gessler , balance thine account with Heaven ! Lucerne, Meggenhorn Castle at / B . Figurines. 5½ × 7½ in (14 × 19 cm). – BACK: The “Hollow Lane” at Küssnacht. View upwards at Gymnasium Immensee and Mission Bethlehem. 8¾ × 6 in (22.1 × 15.2 cm). – See the complete description. New Habsburg, Castle / B . View from lakeside. 5⅝ × 7¼ in (14.3 × 18.4 cm). – BACK: Glacier Garden in Lucerne. 5⅞ × 4 in (14.9 × 10 cm). Rigi from Lucerne, The / B . Boats on the lake. 4⅝ × 7⅜ in (11.7 × 18.8 cm). Rigi, Vista from the / A . Tourists on the peak. – See the complete description. Rigi Railway Bridge over the Schnurtobel / B . 8⅛ × 7⅜ in (20.7 × 18.7 cm). – BACK: View from the Rigi at Kaltbad. The latter itself in front. 5 × 7½ in (12.7 × 18.9 cm). Alpine Inn in the Snow / B . Among the further properties on both sides the church, too. Guest scenery. 6⅛ × 7⅜ in (15.7 × 18.8 cm). – See the complete description. Viznau / B . Central view. Railway carriage scenery + railroad workers. 7½ × 5⅞ in (19.2 × 14.9 cm). – BACK: Sunset on Rigi-Kulm. Experienced by numerous tourists. 5½ × 7⅜ in (14.1 × 18.7 cm). Seelisberg, Känzli on / B . 7½-7⅞ × 5⅛ in (19-20 × 13 cm). Basle / A . Central view over the Rhine with the Rhine bridge and larger part of the bank on this side. – Sovereign view after Richard Püttner. – Varyingly with Dutch caption. – Slightly foxing. – See the complete description. Basle – At the Cathedral / B . Charming figure scenery. 8⅞ × 6¼ in (22.4 × 15.8 cm). 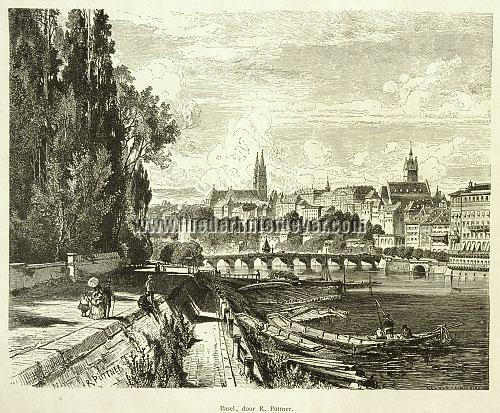 – BACK: At the Rhine above B. Boat scenery. 2⅞ × 5⅛ in (7.2 × 12.9 cm). – Portal of the Cathedral & Well with the Peasant’s Dance / B . 3⅞ × 4¾ and 4⅜ × 2 in (9.7 × 12 and 11 × 5.2 cm) resp. – BACK: Rheinfelden. 6⅞ × 4¼ in (17.5 × 10.7 cm). – See the complete description. – City Hall / B . 5 × 3 in (12.7 × 7.7 cm). – See the complete description. – Court of City Hall / A . Figurines. – Spahlen Gate and Holbein Well / B . Manifold scenery. 6¾ × 7⅜ in (17.2 × 18.7 cm). – BACK: Olten. Central view. 3⅝ × 7½ in (9.3 × 19 cm). – Spahlen Gate / B . 5 × 3½ in (12.6 × 9 cm). – See the complete description. – Statue of Munatius Plancus / B . 5 × 3⅛ in (12.7 × 7.8 cm). – See the complete description. – The Madonna with the Family of the Mayor (Jacob) Meyer. With crown and the child on the arm standing in a niche. On both sides the family predominantly praying. Steel engraving by William French (c. 1815 – East Grinsteadt 1898) after Hans Holbein II (Augsburg 1497/98 – London 1543). C. 1840. 7⅞ × 4⅜ in (20 × 11.2 cm). The Dresden version of the lately so notorious “Darmstadt Madonna” as one of the “most popular” works (Thieme-Becker), created between 1519 + 1526. See the illustration of which in Knackfuß, Dürer und Holbein der Jüngere, 1895, p. 58. – The first version by French with 6⅝ × 4⅜ in (16.8 × 11.2 cm) pure subject size somewhat smaller than the later repetition of the position 14,572 here. – – – – The same in French’s larger repetition from the 3rd quarter of the 19th century by 7¼ × 4⅞ in (18.5 × 12.4 cm) pure subject size (incl. caption 8 × 4⅞ in [20.3 × 12.4 cm]), here in shiningly fine impression. Salmon Catching between Basle and Rheinfelden / B . 5⅜ × 7⅛ in (13.7 × 18 cm). – BACK: Old Town Gate in Solothurn. 5¼ × 4⅝ in (13.5 × 11.8 cm). – Especially instructive depiction of salmon catching. – See the complete description. Weissenstein, At the / B . With local view. 6⅝ × 7½ in (16.7 × 19 cm). Solothurner in festive Dress, Female / B . 5¾ × 4⅛ in (14.6 × 10.5 cm). Bern – Fruit Market before the Wine Hall of Wyss / B . 3⅝ × 7⅜ in (9.2 × 18.8 cm). – BACK: Girl from the canton B. 7⅜ × 4¾ in (18.7 × 11.9 cm). – Engi Promenade / B . 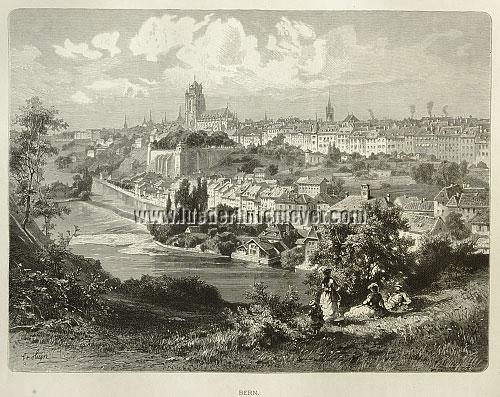 With the charming town view at the quarter around the cathedral and equal scenery with i. a. mounted policeman. 4¼ × 7⅝ in (10.7 × 19.3 cm). – BACK: Place in B. Figurines. 7½ × 4¾ in (19.2 × 12.2 cm). – Central view / A . In front the Aar with resting family. – See the complete description. – Kesslergasse / B . I. a. with hay-load. 8⅛ × 4⅞ in (20.7 × 12.5 cm). – City Hall / B . Manifold scenery. 5½ × 7⅜ in (13.9 × 18.7 cm). – BACK: Bear Pit with four animals. 6⅝ × 4⅞ in (16.7 × 12.4 cm). – See the complete description. – At the Nydeck Bridge / B . 4⅞ × 7½ in (12.3 × 18.9 cm). – Cathedral Place with Erlach’s Memorial / A . Accessories. – Tourists at the Time Bell Tower / B . 8⅞ × 6⅝ in (22.5 × 16.9 cm). – BACK: Castle at Burgdorf. One-horse carriage scenery. 8⅛ × 7⅜ in (20.7 × 18.8 cm). Johann Elias Ridinger (Ulm 1698 – Augsburg 1767). The Brown Bear. Sitting, looking at the beholder. “Now and then it shall occur in Switzerland in this quite peculiar (russet) color ” (Th.). Colored etching with engraving. Inscribed: VRSVS MINOR RVFO FVSCVS. / Der Zeydel Bär. / Ours petit voussatre. / Familia IV. Fünffzähige. / J. El. Ridinger fec. et excud. A.V. 12⅛ × 8⅛ in (30.7 × 20.7 cm). Thienemann & Schwarz 1081. 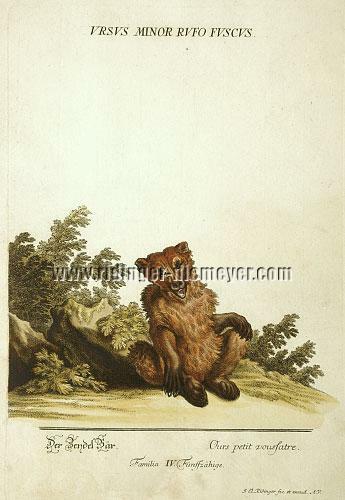 – IN THE RIDINGERS’ ORIGINAL COLORING from the unnumbered Colored Animal Kingdom created since 1754 and concluded finally posthumously not before 1773 (“Complete copies are next to untraceable”, so Weigel, Art Cat., part XXVIII, Ridinger Appendix 63a as merely 120-sheet torso, 1857 ! , but also just individual plates quite rarely on the market only at niemeyer’s presently nevertheless the one as the others). – Remaining uncolored contrary to the prospectus, a second edition from the plates shortened even under loss of animals and with modified titling and the Ridinger inscription removed, yet now numbered, was published by Engelbrecht/Herzberg in Augsburg 1824/25. (Johann Christoph Adelung, Grammatisch-kritisches Wörterbuch der hochdeutschen Mundart, 2nd ed., Leipsic 1801, vol. 4, col. 1671). “as for this purpose it is the most decent and best”. – Margins on three sides 2-3.5 cm, below 5.2 cm wide. – In the lower white plate/paper field hardly perceptible tidemark. Langnau in the Emmenthal, Forge of / B . Works in front of it. 5 × 7 in (12.8 × 17.8 cm). Jungfrau seen from Interlake, The / B . 5⅞ × 7⅜ in (15 × 18.8 cm). – BACK: Old Cloisters and Nut-tree Avenue in Interlake. 3⅝ × 7½ in (9.2 × 19 cm). Bernese Oberland, Before a Church in the / A . Rich visitor’s scenery. Interlake – Street, richly frequented by tourists, i. a. in carriage and pair. 6 × 7½ in (15.2 × 19 cm). – BACK: Promenade, equally frequented. 5⅜ × 7½ in (13.7 × 19 cm). Interlake – At the Bridge / A . In front horses in the horse-pond. 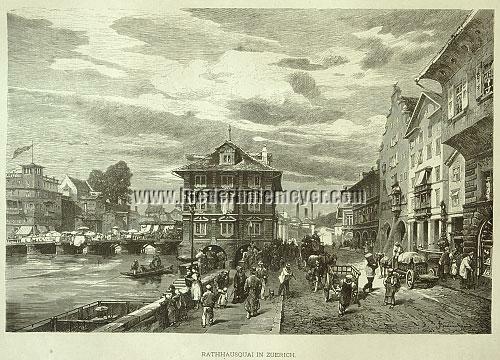 – Street with the Manufactory of G. von Bergen & Co. in the center, richly frequented by idlers / B . 5½ × 7⅜ in (14.1 × 18.7 cm). Thun – Central view from this side of the lake with fine view of the mountain ridge / A – See the complete description. – Street with partially commercial scenery / B . 5 × 7⅜ in (12.6 × 18.8 cm). – Schadau Castle near Thun / B . In front the lake with boat. 4⅞ × 7⅜ in (12.5 × 18.7 cm). 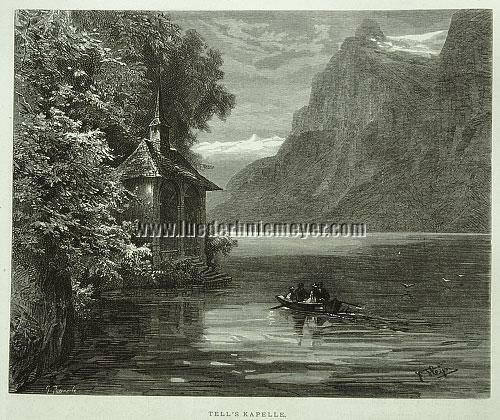 – BACK: Sawmill at Lake Thun. 5 × 4⅝ in (12.8 × 11.8 cm). Brienz, At Lake / A . Tourist with binoculars, helping his lady boarding a boat guided by a girl in traditional costume. Meiringen / B . General view. 6 × 7½ in (15.2 × 19 cm). 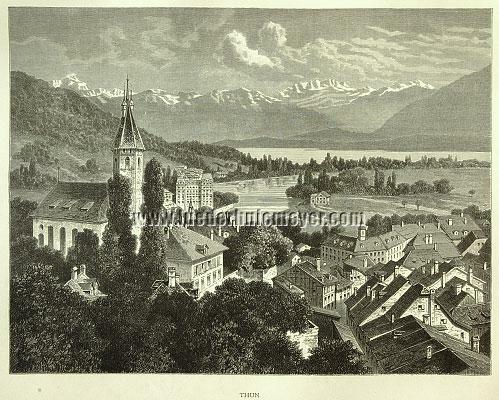 – BACK: Oberhofen at Lake Thun. General view from a boardwalk in the foreground. On this lady with fan + Appenzeller dog. 5⅜ × 7⅜ in (13.6 × 18.7 cm). Meiringen, Street in / B . In front laundry women and cowherd at the well. 8¼ × 5⅝ in (21 × 14.4 cm). – BACK: Sawmill in Reichenbach. Trade and tourist scenery. 4½ × 7⅜ in (11.5 × 18.8 cm). Hasleberge, Schwinget on the / A . Local fun. Brienz Lakeside, At the / B . Line of houses on the lake at which a boatman invites tourist for a ride. 4¼ × 7½ in (10.9 × 19 cm). – BACK: On the Hasleberge. Mill property, before painter with easel, surrounded by tourists. 5⅛ × 7⅜ in (13 × 18.7 cm). Wetterhorn and Wellhorn seen from Rosenlaui / A – See the complete description. Giessbach Hotel / B . In front tourists and the mountain slope. 8½ × 6⅝ in (21.5 × 16.9 cm). – BACK: At Lake Brienz. 4¾ × 7⅝ in (12.2 × 19.3 cm). Giessbach / B . With bridge. 6 × 7⅜ in (15.2 × 18.8 cm). 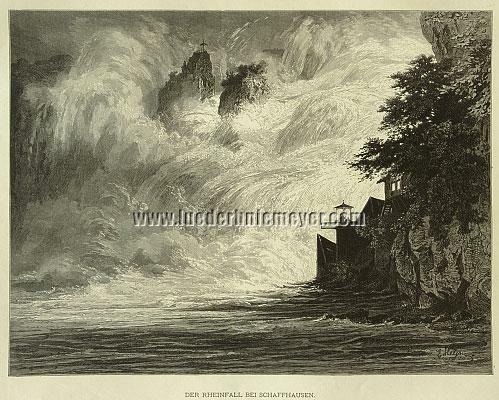 – BACK: Upper Giessbach Fall. 5 × 2⅜ in (12.6 × 6.1 cm). Bernese Oberland, Sale of Wood-carvings / A . Arrogant buyer on the spot. 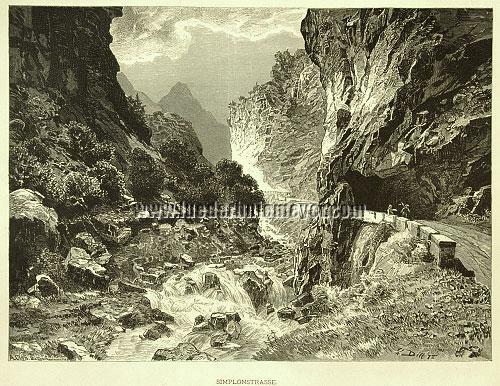 Staubbach, Lauterbrunnen Valley with / B . 5⅞ × 7¼ in (15 × 18.5 cm). – BACK: Alphornists. 5⅝ × 3⅛ in (14.4 × 8 cm). Staubbach, A Surprise at the / B . Tourists surprised by cloudburst. 6¾ × 5⅜ in (17 × 13.7 cm). – BACK: Trümleten Creek. 5¼ × 4¾ in (13.5 × 11.9 cm). Bernese Oberland, Tourists in the / A . Partially mounted. Faulhorn, On the / B . With the terrace frequented by tourists. 4⅞ × 7½ in (12.4 × 18.9 cm). – BACK: (Pipe-smoking) Character out of the Lauterbrunnen Valley. 3⅞ × 3⅞ in (9.8 × 9.8 cm). – See the complete description. Bernese Oberland, Inn’s Room in the / A . – Weak pleat above. Apollo Butterfly and Black Salamander / B . 6½ × 4¾ in (16.5 × 12.1 cm). Finsteraarhorn and Aar Glacier / B . With tourists in front of a chalet. 5¼ × 7⅜ in (13.2 × 18.8 cm). – BACK: Rock scenery on the Scheidegg. 5⅝ × 7⅜ in (14.2 × 18.8 cm). Engelhorns and Wetterhorn with Rosenlaui Glacier / B . 7 × 6¾ in (17.7 × 17 cm). – BACK: Customs Duty in the Bernese Oberland. 5⅝ × 7½ in (14.3 × 18.9 cm). Alpine Diary in the Bernese Oberland / B . Instructive interior view. 6 × 7⅜ in (15.2 × 18.8 cm). Wellhorn and Wetterhorn / A – See the complete description. 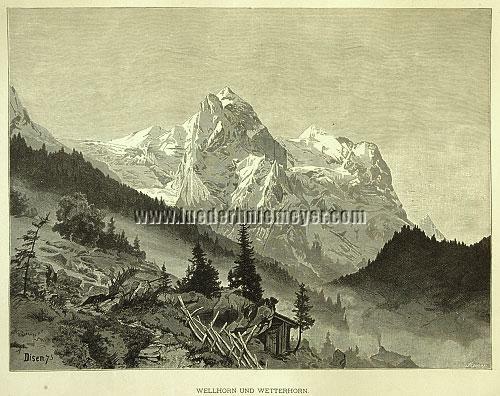 Wetterhorn, The. With accessories. Steel engraving. C. 1855. 4½ × 5¾ in (11.5 × 14.5 cm). – See the complete description. Reichenbach on the Way to Rosenlaui, The / A . With blockhouse, in front woman with pannier resting at a stage. – Very fine scenery. – See the complete description. Mürren seen from Gimmelwald / B . 6⅞ × 7½ in (17.5 × 18.9 cm). 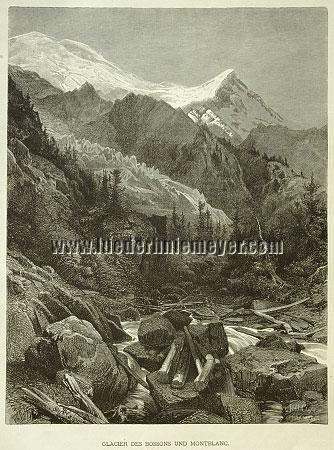 Schmadribach Falls seen from the Alpine Diary of the Bohnenmoos, The / B . 7¾ × 7½ in (19.8 × 19 cm). – BACK: Milkboy in the Bernese Alps. 6 × 4¼ in (15.2 × 10.9 cm). 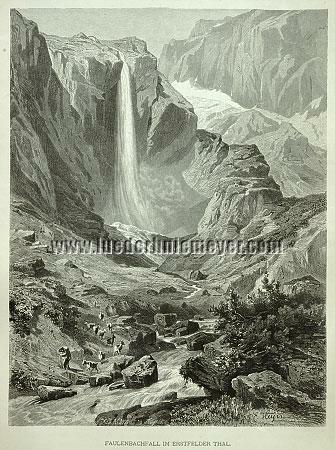 Handeck Fall, The / B . On the bridge figurines. 9¾ × 5½ in (24.7 × 13.9 cm). – See the complete description. Alpine Landscape in the Snow / B . With two mountain wanderers. 5⅛ × 7⅜ in (13.1 × 18.8 cm). – BACK: Motif from the Handeck. Rich live stock scenery. 4⅛ × 7⅜ in (10.6 × 18.8 cm). – See the complete description. Handeck and the Grimsel, On the Road between the / A . With rich, partly mounted tourist scenery. – See the complete description. Rock Crystal Searchers on the Grimsel / B . 3⅛ × 7¼ in (7.9 × 18.3 cm). – See the complete description. Neuchâtel / B . Central view with the castle. On the right in richly decorated separate field putto holding coat of arms. 5⅝ × 7⅜ in (14.4 × 18.6 cm). – Market, supposedly before city hall / B . As richly frequented as charming view of the quarter with vista on the built-up heights. 5¾ × 7½ in (14.5 × 19 cm). – BACK: Fruit Ships on the Lake of See. In front trade scenery at the former. Set back beach quarters. 5¾ × 7⅜ in (14.5 × 18.8 cm). Neuchâtel at Yverdon, Lake of / B . Boat scenery. 4½ × 7⅜ in (11.3 × 18.7 cm). – BACK: Part in Neuchâtel. Dominating large two-wheeled barrel-wagon. 6½ × 4¾ in (16.5 × 12 cm). Freiburg, Part in / B . With manifold laundry women scenery at the well and at tubs. 8 × 4 in (20.4 × 10 cm). And fair large rivers glide serenely on . Montreux, At / B . Central view with manifold scenery on and at the boats. 5 × 7⅜ in (12.7 × 18.7 cm). 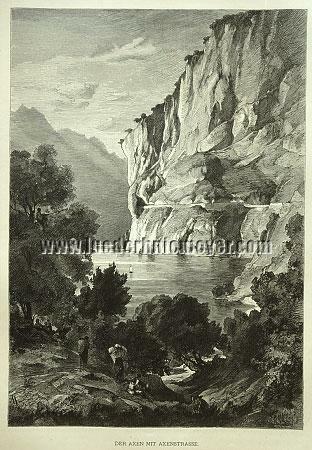 – BACK: Gorge du Chaudron near Montreux. 8⅛ × 3⅞ in (20.5 × 9.8 cm). Montreux, Moorings at / B . With general view. At the landing stage in front natives and tourists wait for the approaching steamer. 5⅞-7⅝ × 4⅛-7 in (14.9-19.5 × 10.4-17.7 cm). – BACK: Church near M. 5¼ × 7⅛ in (13.5 × 18.1 cm). Vevey, Local Life in the Harbour of / B . Market people with carriages + boats. 5¼ × 7⅜ in (13.2 × 18.6 cm). – BACK: Dent du Midi seen from Vevey. 4 × 4¾ in (10 × 12.1 cm). Guin in the Canton Freiburg, Staircase to the Church in / A . Rich church-goers scenery, but also a sketching painter. Vevey, Moorings in / B . Richly staged fine local view. 3⅞ × 7⅜ in (9.7 × 18.8 cm). – BACK: Meillerie. 3⅛ × 7⅜ in (8 × 18.8 cm). Vevey, Bosquet de Julie near / B . 5½ × 7½ in (14 × 19 cm). – BACK: On the bank at Chateau Chillon. 4 × 7⅜ in (10.2 × 18.8 cm). Vevey, Vine-Feast in / A . Parade of finest pictorial effect with all utensils including the press. Waadt, Girls from the Canton / B . 7⅜ × 3 172-4¾ in (18.8 × 9-12 cm). Lausanne / B . General view with lake view in moonlight. 5⅝ × 7⅜ in (14.2 × 18.7 cm). – BACK: Church St. François at the same place. Before rich scenery. 7½ × 4⅝ in (19.1 × 11.8 cm). – See the complete description. Train at the Lake Geneva, In the / B . Wagon crowded with natives + tourists. 3⅞ × 7¼ in (9.7 × 18.5 cm). – BACK: At the Arve. 3⅛ × 4⅞ in (8 × 12.5 cm). Geneva, Rousseau Memorial in / B . 5 × 7⅜ in (12.6 × 18.8 cm). – BACK: Quarry on the Salève. 5⅛ × 7⅜ in (13 × 18.8 cm). – See the complete description. Geneva / A . General view over lake at twilight. In front boats. – See the complete description. Chamonix, In / B . Rich quarter scenery before the church, also with carriage. 7⅝ × 4½ in (19.3 × 11.5 cm). 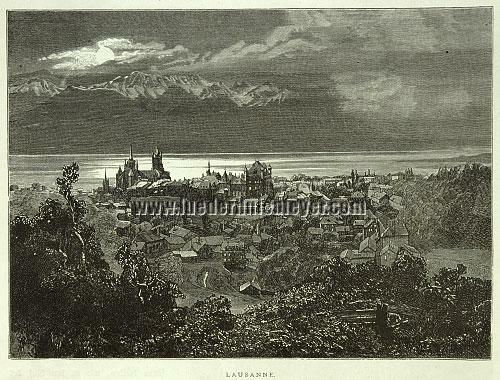 – BACK: Vegetation at Lake Geneva. With vista of the latter. 9½ × 6⅛ in (24 × 15.6 cm). Montblanc, The “Sea of Ice” “Sea of Ice” (Mer de Glace) of the / B . In front wanderer. 8⅞ × 6⅛ in (22.6 × 15.7 cm). – BACK: Part from the Salève. 2⅞ × 4⅝ in (7.3 × 11.7 cm). – See the complete description. Tête Noir / B . In front on the pass figurines either mounted or leading their horse. 4⅛-7¾ × 2¾-4¾ in (10.5-19.7 × 6.9-12 cm). – BACK: Le Chapeau. Before tourists partially having a snack. 6⅛ × 3⅜ in (15.7 × 8.7 cm). Bossons and Montblanc, Glacier of / A. – See the complete description. Sallanches, At / B . 2⅜ × 4⅝ in (6 × 11.7 cm). – Outside of the picture somewhat foxing. Viège near Monthey, At the / B . 5⅞ × 7½ in (14.8 × 19 cm). St. Maurice / B . General view set back behind the bridge amidst the mountains. 5¾ × 7½ in (14.7 × 19 cm). 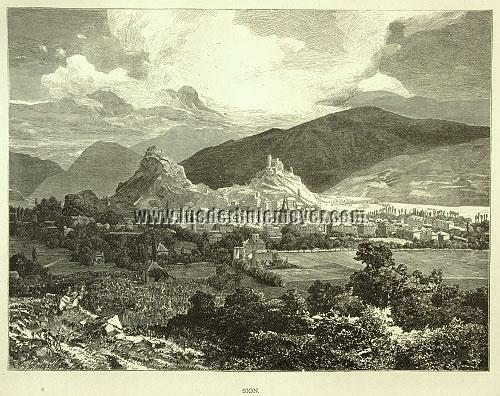 – BACK: Cloisters in Martigny. 7⅞ × 5 in (20.1 × 12.7 cm). Massonger / B . 4½ × 7½ in (11.4 × 19 cm). Rhone Valley, Thunderstorm in the / A . In front fleeing live stock. St. Bernhard, On the Height of the Pas of the Great / B . Set back the hospice, in front monks with Newfoundlanders. 6 × 7½ in (15.1 × 19 cm). – BACK: Cascade de la Sallenche. 6⅝ × 3⅛ in (16.7 × 8 cm). Trient in the Valais, Glenn of the / A . On the gallery tourists. Simplon, Customs Clearance Isella on the / B . Clearance of a covered wagon with six horses in front of the Hotel de la Poste. 4½ × 7½ in (11.4 × 18.9 cm). St. Bernhard Dogs / A . In the background assumedly the hospice of the Great St. Bernhard. Lac de Mont d’Orge above Sion / B . In front small scenery. 5⅛ × 7⅜ in (13 × 18.8 cm). – BACK: Sion. General view. 3⅛ × 4⅝ in (8 × 11.8 cm). Simplon Pass / A . With two travelers. – See the complete description. Sion, Market in / B . Busy activity, i. a. the local town-crier with drum. On the left well. 3⅜-5⅞ × 2 172-7⅜ in (8.5-14.8 × 6.4-18.8 cm). Sion / A . General view. – See the complete description. Sion, Forest Chapel in the Mayens near / B . Richly visited. 5½ × 7⅜ in (14 × 18.6 cm). – BACK: Roûma above Sion. View of the quarter. 4¾ × 7⅜ in (12.2 × 18.7 cm). Leuk and the Gemmi, Bad / B . General view. 5⅜ × 7⅜ in (13.6 × 18.8 cm). – BACK: Part of city hall in Brieg. 8¾ × 2½ in (22.3 × 6.3 cm). Valais, Mill in the / B . In front the donkey. 5⅝ × 7⅝ in (14.3 × 19.3 cm). – BACK: Type of a Valais wooden house. Behind chapel. 4⅞ × 5¾ in (12.3 × 14.7 cm). Valais Children in the Rhododendrons / B . Behind live stock. 5 × 5⅞ in (12.6 × 15 cm). Valais Children at the Day before Corpus Christi / A . Bringing young trees and green from the forest in baskets carried on the head. Useigne, The Pyramids of / B . Figurines on the street. 5⅝-7⅛ × 1¾-4¼ in (14.2-18 × 4.4-10.8 cm). Matterhorn, Riffelhornsee and / B . 8⅛ × 6⅜ in (20.6 × 16.3 cm). – BACK: Wildcat and Coughs. Of the latter there are two, but only one can get away. 7⅛ × 7⅜ in (18.2 × 18.7 cm). – See the complete description. Zermatt, Before / B . General view in the snow. In front mountain climbers on a wooden bridge. 5⅛ × 7⅛ in (12.9 × 18 cm). 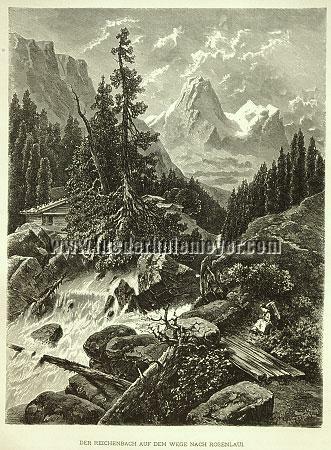 – BACK: Monte Rosa seen from the Riffelhaus. In front partially mounted tourists. 6⅛ × 7⅜ in (15.5 × 18.7 cm). Monte Rosa – Visp – Viège – Mont-Rosa from Vispach, The. View along the Visper Valley up to the glaciers of the Monte Rosa. To the left the village, in front two anglers. Steel engraving. C. 1855. 4½ × 5⅞ in (11.5 × 15 cm). – See the complete description. Castor and Pollux, The Twins / B . 5⅛ × 7⅜ in (13 × 18.6 cm). – BACK: Out of Zermatt Valley. With mill property. 7¾ × 4¾ in (19.7 × 11.9 cm). 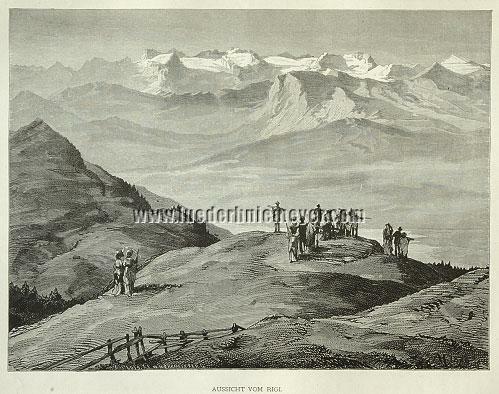 Eggischhorn, (Tourists) at the Peak of the / B . 4⅞ × 7⅜ in (12.3 × 18.8 cm). – BACK: Part in Täsch. Figurines. 6½ × 4½ in (16.4 × 11.3 cm). Kandersteg, Hotel Victoria in, with view at Blümlisalp and Doldenhorn / B . On the pasture in front guests. 4¾ × 7⅜ in (12.2 × 18.7 cm). – BACK: Kanderfall. With partially mounted tourists. 8 × 5⅜ in (20.4 × 13.7 cm). Gemmi Pass and Daubensee / B . 6½ × 7½ in (16.5 × 18.9 cm). Lugano / B . General view. 6 × 7⅜ in (15.4 × 18.8 cm). – See the complete description. Bellinzona / A . View of the citadel quarter. Figurines. – See the complete description. 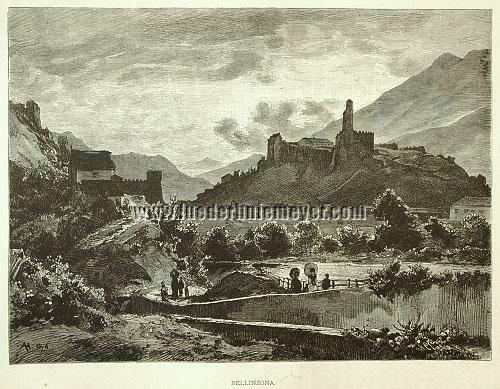 Bellinzona, In / B . Richly enlivened view of the quarter below the citadel. 8⅛ × 5¼ in (20.7 × 13.5 cm). – BACK: Village Scenery in Val Leventina. With commercial figuration. 6½ × 4⅝ in (16.6 × 11.8 cm). Biasca / A . With figurines in the quarter below the church. Faido, Exit of the Piotta Glen at / B . Above the place. 5 172 × 7½ in (14 × 18.9 cm). – BACK: Bridge over the Tessin at Faido. On this wood cart + figurines. 4 378 × 7⅜ in (11.1 × 18.7 cm). Val Tremola / A . With carriages on the serpentine road. – See the complete description. 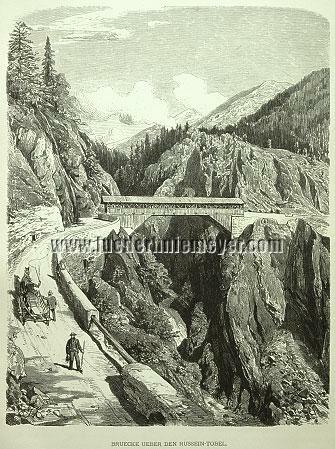 Airolo, Glen of the Tessin at / B . In front chapel + bridge. 9⅛ × 6⅛ in (23.2 × 15.7 cm). – BACK: Market Place in Faido. Market scenery. 7⅜ × 4⅝ in (18.6 × 11.7 cm). St. Gotthard, Hospice on the / B . Before great carriage scenery. 5⅞ × 7⅜ in (15 × 18.7 cm). – BACK: Funeral Chapel on the St. G. 8½ × 5¼ in (21.5 × 13.2 cm). 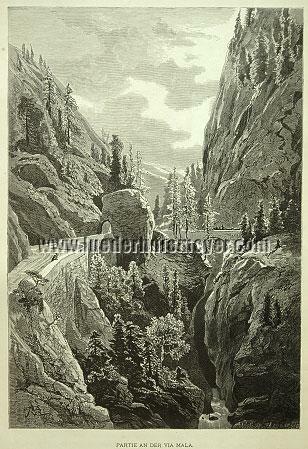 St. Gotthard, Quarries on the Height of the Pass of the / A . Carriage scenery. Urserenthal with Retrospect at Hospen Valley, Andermatt and Oberalpstraße / B . 5¾ × 7⅜ in (14.7 × 18.6 cm). – BACK: Realp. 4⅛ × 5⅞ in (10.6 × 14.8 cm). Vrin in the Lugnetz Valley / B . General view with busy inhabitants. 5 × 7⅜ in (12.6 × 18.6 cm). Vrin in the Lugneth Valley, Traditional Costumes at / B . 5⅝ × 4 in (14.4 × 10.2 cm). Lukmanier Pass, Hospice Santa Maria on the / B . Before figurines and resting saddle horses. 4⅝ × 7¼ in (11.6 × 18.5 cm). – BACK: At the entrance of the Somvixer Tobel. Peasants before the properties partially storing wood. 5¼ × 7¼ in (13.5 × 18.5 cm). Val Medels, Cottages and People from / B . The inhabitants before the property, busy to pile up the bundled hay (?) by means of a rope appliance onto covered high trestles. 4¾ × 7⅜ in (12 × 18.7 cm). – BACK: Piz Badus and Lake Toma. In front a chamois, in the air predatory bird. 7¾ × 5⅜ in (19.6 × 13.8 cm). Russein Tobel, Bridge over the / A . Wagon & highlander accessories. – See the complete description. Dissentis / B . General view. 2⅝ × 7⅜ in (6.8 × 18.8 cm). – ABOVE: Chapel at Trons. 2½ × 5¾ in (6.2 × 14.7 cm). – BACK: Part at the Flimsersee. Cowboy scenery. 4¼ × 7¼ in (10.7 × 18.4 cm). Chiamut, Village / B . General view. With inhabitants assumedly making hay. The several high trestles for the hay piles still uncovered and empty. 4⅞ × 7⅜ in (12.5 × 18.7 cm). – BACK: Chapel at Trons. With figurines. 5¼ × 6⅛ in (13.2 × 15.7 cm). Lukmanier Road in Val Medels, The / A . With carriage and pair. Meierhof in Obersaxen, Village / B . General view. Cattle + figurines. 5 178 × 7⅜ in (13.1 × 18.6 cm). Ilanz, Upper Gate in / B . Figure scenery. 6 × 7⅜ in (15.2 × 18.8 cm). – BACK: The Frauenthor of Porclas near Ilanz. 5¼ × 5¼ in (13.5 × 13.3 cm). Ilanz – Town Gate / B . Nicely arranged view of the quarter under snow. 5⅜ × 5¾ in (13.7 × 14.5 cm). – BACK: Episode from the fight of the Bündner at Ems 1799. 3½ × 5½ in (8.8 × 14 cm). Reichenau, Confluence of Anterior and Posterior Rhine at / B . 5⅛ × 6¼ in (13.1 × 15.8 cm). Chur seen from the Hotel Steinbock / A . Manifold figurines and splendid carriage-and-four. – See the complete description. Chur, Market in / B . 7⅛ × 4⅝ in (18.2 × 11.7 cm). 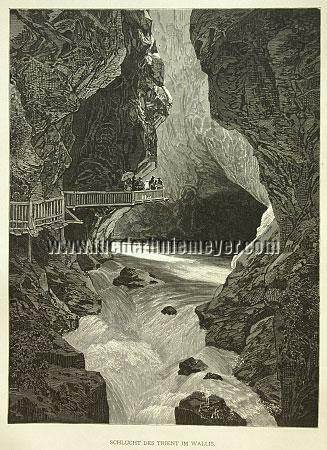 – BACK: Promenade at the Rock Gate near Ragaz. 5 × 7⅜ in (12.6 × 18.8 cm). Felsberg with the Calanda / B . General view. In front angler. 5¼ × 6⅛ in (13.2 × 15.7 cm). – BACK: Citadel of Rhäzüns. 5¼ × 6½ in (13.5 × 16.5 cm). Thusis and Entrance into the Via Mala / B . General view. In front tourists. 5¾ × 7½ in (14.6 × 19 cm). – BACK: Ruins of Hohen-Rhätien. Before partially picnicking tourists. 5 × 7⅛ in (12.8 × 18 cm). Thusis / B . General view from the heights. In front bridge. 3⅜ × 5¼ in (8.6 × 13.4 cm). – BELOW: Lake Toma. 3⅞ × 7⅜ in (9.9 × 18.7 cm). – BACK: Ortenstein + Juvalta. 9¾ × 2⅛-2¾ in (24.8 × 5.4-7.1 cm). Splügen, In Village / B . Central view. 6¼ × 7½ in (15.8 × 19 cm). – BACK: Houses in Zillis. Figurines. 5¼ × 6¼ in (13.2 × 15.9 cm). Splügen, Village / B . With fine mountain scenery. 5⅝ × 7⅛ in (14.2 × 18 cm). 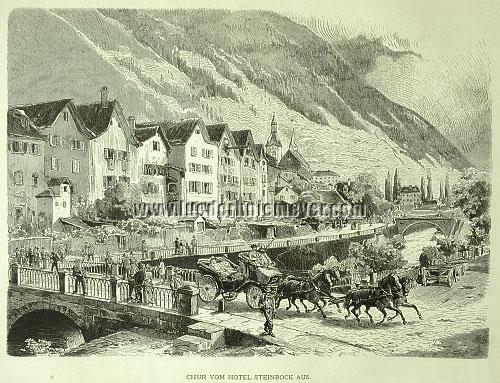 – BACK: Village Hinterrhein. Evening sujet on the village place. 3⅝ × 7 in (9.2 × 17.7 cm). Splügen, The Road across the. Steel engraving. C. 1850. 4⅝ × 6¼ in (11.8 × 15.8 cm). – See the complete description. Hinterrhein, In Village / B . Richly frequented street part with view onto the mountains. 5¾ × 7¼ in (14.5 × 18.5 cm). 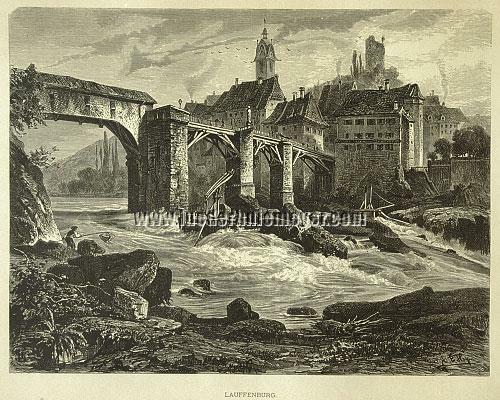 – BACK: Rhine falls in the Rofla glen at Andeer. 7½-7⅞ × 5⅛ in (19-20 × 13 cm). Rheinwald Glacier with the Source of the Hinterrhein / B . In front traveler. 9 × 6¾ in (22.7 × 17 cm). – BACK: Painter in the Hinterrhein valley before property, chatting with the inhabitants. 5½ × 7½ in (13.9 × 19 cm). Bernardino, Lake and Chalet / B . Postal carriage + guest scenery. 4⅝ × 7⅜ in (11.7 × 18.7 cm). – BACK: Characters from the Hinterrhein valley. 6⅜ × 5⅛ in (16.2 × 13 cm). Via Mala, Part at the / A . Sovereign, bright view from above with the road to the left and carriage-and-four on the bridge. – After Themistokles von Eckenbrecher. – See the complete description. – The same / A . Gruesome-beautiful from below. – After Richard Püttner. San Bernardino, Village / B . Central view. In front the street at Hotel Rocco, frequented by tourists. 4⅜ × 7⅜ in (11.2 × 18.7 cm). – BACK: Ruins of Mesocco Castle. Animal + figure scenery. 6¾ × 6½ in (17.2 × 16.5 cm). Roveredo / B . Central view with the bridge front left. On the bank on this side also angler. 4⅞ × 7⅜ in (12.4 × 18.7 cm). – BACK: People from the valley of the Moësa. Chatting under old trees before property. 4⅜ × 6⅝ in (11 × 16.8 cm). 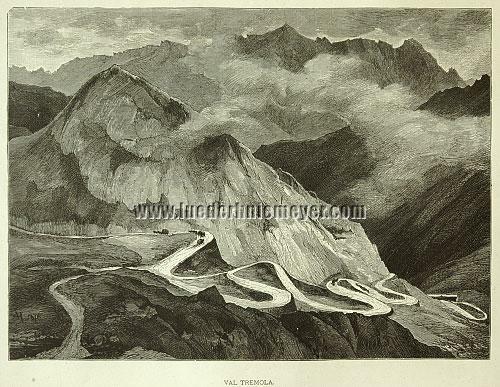 Weissenstein on the Albula Pass / B . Central view with the street to the left, frequented by carts and figures. 5⅛ × 7⅜ in (12.9 × 18.8 cm). – BACK: Landslide at Marmorera. 5⅞ × 7⅜ in (15 × 18.8 cm). Mountain Dogs Fighting with a Wolf / A . From the cottage the armed Alpine herdsman appears. – See the complete description. Schuls / B . General view. 5¾ × 7½ in (14.5 × 18.9 cm). – BACK: Veltlin traditional Costumes. Several generations joined in the house. 5⅝ × 7⅜ in (14.2 × 18.7 cm). St. Moritz, Inn Fall at / A . Figurines on and at the bridge in front. Lower Engadine, Woman from the / B . 8 × 5⅞ in (20.2 × 15 cm). Prättigau Defile, The / B . Coach with four on the road to the right. 8¼ × 6⅝ in (21 × 16.9 cm). 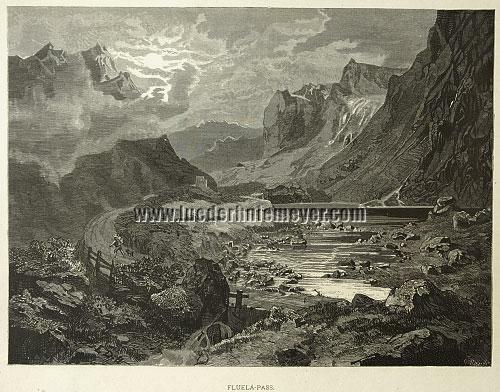 Fluela Pass / A – See the complete description. Tamina Glen, In the / B . Numerous tourists on the road to the right. 8⅞ × 6¼ in (22.6 × 15.8 cm). – BACK: Bad Pfäffers. Several guests before the spa (?). 5¼ × 6⅜ in (13.4 × 16.1 cm). Pfäffers / B . General view. 4⅞ × 7⅜ in (12.4 × 18.7 cm). – BACK: Same place. Spa. 4⅜ × 2¼ in (11.2 × 5.8 cm). – Tamina. 8⅛ × 3⅛ in (20.6 × 7.8 cm). Zillis – Farm part with covered wagon ready for departure / B . 4⅜ × 7⅛ in (11.1 × 18.2 cm). – BACK: Rheinwald Glacier. 4⅝-9¼ × 3½-7⅛ in (11.7-23.5 × 9-18.2 cm). Rhäzüns / B . Front right castle. 3½ × 7¼ in (8.8 × 18.5 cm). – BACK: Lost Hole. 4⅜-9⅜ × 3⅛-7⅛ in (11-23.9 × 8-18 cm). Ragaz / B (varyingly with Dutch text). View from the heights with impressive mountain scenery. 6½-7¼ × 7⅛ in (16.5-18.4 × 18.1 cm). – BACK: Vaduz. 5⅛-6½ × 3⅞ in (13-16.6 × 9.8 cm). – See the complete description. « I should want breathing room in such a land .